PulpTech Sales is pleased to offer the Line-Tec 200 Fiber Optic Edge Guide System , a new product from Conmark Inc. The Line-Tec 200 Edge Guiding System is a fiber optic fabric edge detection system, which operates on a proven non-contact transmission principle. An optical sensor is placed on the side of the felt or wire and an infrared pulsated light curtain is transmitted from the transmitter to the receiver. The web is blocking the light relative to the edge of the fabric. Edge position signal 4-20mA is transmitted to the pneumatic control system, which controls the angle of the fabric control roll. Typical applications include paper machine wires, board webs and felts. The optical sensor is not affected by dirt, steam or temperatures up to 350 °F. The optical sensor is connected through a fiber-optic cable to an infrared amplifier located in an enclosure away from the heat of the running web. The amplifier sends a special light signal through the transmitting element to the receiving element. The transmitted light is picked up by the receiving element and transmitted to the amplifier. This returning signal is then converted to a 4-20 mA current signal, which is used to provide control signal to edge control system. Due to non-contact measuring principle LT-200 will not wear fabrics or felts edges. 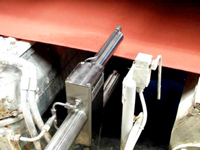 This ensures the maximum lifetime of the fabric, and a higher production speed of the machine. Precise, continuous monitoring of the edge position with pulsated infrared light. Immediate reaction to an edge position due to the 4 kHz light frequency. No disturbance from direct or reflected visible or infrared light, static electricity, steam, extreme temperatures, dirt or vibration. Minimal installation space required. The unit may be installed in any environment around and inside of the paper machine. The sensor has the accuracy of 1 mm. LT-200 works with all existing guiding actuators, as well as with pneumatic and electrical actuators. Measuring sensor can be mounted either front side or back side of the machine. System is equipped with a rotating mounting bracket. This for example will be used during roll change.